While small form factor support on AMD motherboards hasn't been as good as it has for Intel, there are still some great options, especially when it comes to mini-ITX. 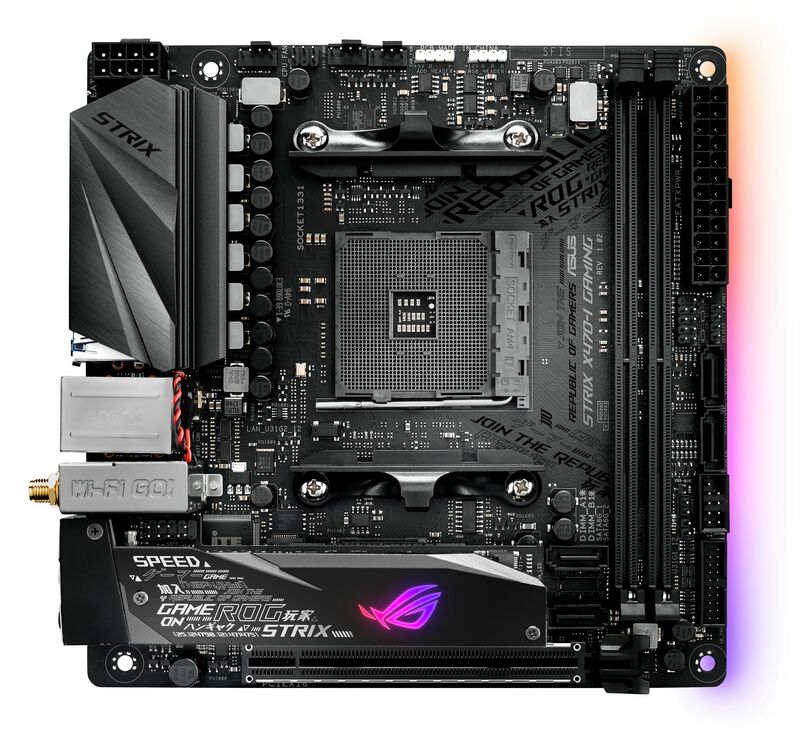 Thankfully, Asus has been one of the front-runners here with particularly nifty 170mm x 170mm boards, and the ROG Strix X370-I Gaming was the most lavish dinky X370 board out there, with hints of Maximus Impact about it on account of the custom audio board and raised M.2 heatsink. 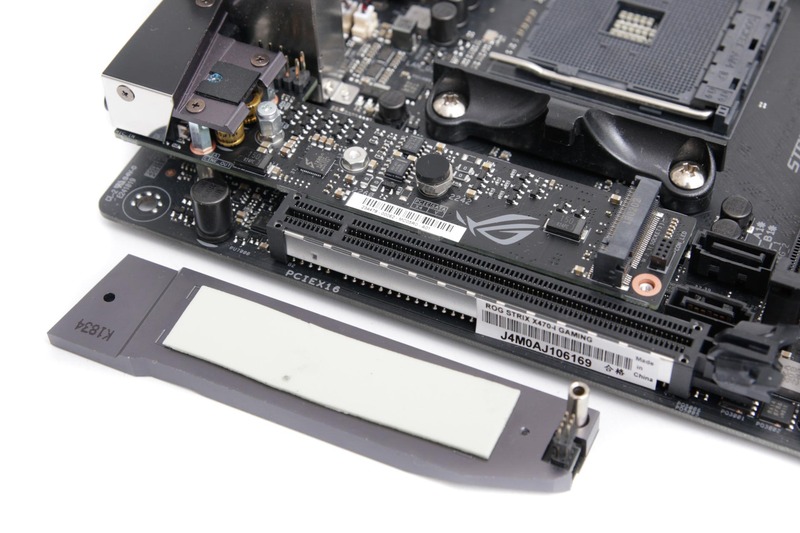 Today we're looking at its successor, and the updated look of the ROG Strix X470-i Gaming is immediately apparent, with dark heatsinks rather than the shiny silver ones on the previous board, although a lot of that comes down to a snazzy fascia on the M.2 heatsink. Software-wise there's some benefit in opting for the new board, chiefly StoreMI - AMD's software feature that can move your regularly-used data from slower drives to faster ones to improve access times. However, with features such as Precision Boost 2 and XFR 2 being built into the CPU, you're not really getting much benefit from the move to the newer chipset at the hardware level. Thankfully, the two boards retail for similar prices, but there have been one or two other tweaks with the new board. It now has two PCIe 3.0 x4-capable M.2 ports, with the second, as usual, located on the underside of the PCB, whereas the second slot on the last board was limited to PCIe 2.0. However, using a PCIe SSD here will see the PCIe lanes to the 16x slot cut in half to eight - not likely to make a massive difference, but you obviously want to avoid that port if you're using just a single M.2 SSD. The top slot is the only one compatible with SATA M.2 SSDs. The final tweak we found was a slightly larger VRM heatsink, but apart from this there's little to choose between the boards apart from the prospect of future feature support being more likely on the X470 board. Once again, though, it's worth remembering that there's not only the ROG Strix B350-I Gaming but also a B450 version of that board available for less than £160, and once again it appears to be identical to the X470 version except it costs £15 less. In all honesty, we can't see why Asus has created two nearly identical boards here - if it were up to us, we'd ditch one of the M.2 ports, the M.2 heatsink and possibly the Wi-Fi and downgrade the Realtek ALC1220 audio to better differentiate the two. As it stands, it's one of the strangest line-ups in the motherboard world, and Asus is left without a sub-£150 mini-ITX offering for Ryzen CPUs. Getting back to the board in question, you certainly won't be disappointed with its set of features. You get three fan headers - yes, that's lacking compared to ATX counterparts, but you won't find more than this even on ASRock's crazy X299 mini-ITX board, so for the form factor it's a lot. The chunky M.2 heatsink, four-pin and three-pin addressable RGB headers, four SATA ports, and a six-phase power delivery all help to make this one of the most lust-worthy mini-ITX boards out there. You also get Intel Gigabit Ethernet and 802.11ac Wi-Fi plus Realtek ALC1220 audio, although 7.1-channel speaker owners should be aware that as there are only three audio outputs, you'll need to plug your fourth cable into your case's front panel audio port, making use of the audio header on the motherboard. Perhaps the only glaring omission from this otherwise feature-packed board is a USB 3.1 Type-C port. There's no header on the PCB nor port on the rear I/O panel, and with no additional expansion slots, assuming you'll be using the 16x PCIe slot for your graphics card, there's no way to add one either, at least not a full speed/power version. Layout is identical to the previous board too and with a huge variety of mini-ITX case designs, a lot will depend on your particular case as to whether decisions such as the grouped trio of fan headers at the top of the PCB along with the RGB headers are an issue when it comes to routing your cables. Speaking of RGB lighting, there's plenty on offer out of the box too, with a row of individually controllable LEDs running the length of the right PCB edge, and the ROG logo in the M.2 heatsink lights up too.